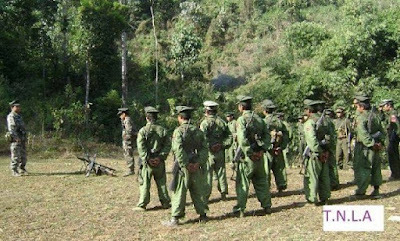 The TNLA’s News and Information Department published on its Facebook page on November 24 a report that it had captured RCSS/SSA mountain outposts in Mantong Township in the Palaung [Ta’ang] Self-Administered Zone. But according to Lt-Col Sai Nguen, the RCSS/SSA spokesperson, the information published by the TNLA was incorrect. He said that his group had not been active in that area for a long time, and that no fighting was currently taking place. Following a series of clashes between two ethnic militias, other armed groups have urged them to hold talks and find peaceful ways to end the fighting. However, no such meeting has yet been held. Clashes between the RCSS/SSA and the TNLA (also referred to as the Palaung Army) first broke out in November 2015, only a month after eight ethnic armed groups including the RCSS/SSA signed a Nationwide Ceasefire Agreement with the Burmese government. The TNLA was excluded from the accord by Naypyidaw. Earlier this week, the TNLA, in a joint operation alongside its allies the Arakan Army (AA), Kachin Independence Army (KIA) and Myanmar National Democratic Alliance Army (MNDAA), launched offensives against Burmese government forces in northern parts of Shan State, including Muse, Namkham and Kutkai townships. Shan Herald attempted to reach TNLA for comment, but has yet to receive a response.